Cool design. The L855 leaves a nice impression with its steel-blue brushed aluminum chassis, remaining pleasantly cool to the touch. Our test will show whether it works as smoothly as its appearance suggests. The Satellite L855-15U comes equipped with a third-generation Intel Core i5-3230M CPU with Intel's Turbo Boost Technology 2.0. A dedicated AMD Radeon HD 7670M graphics card with 2 GB of dedicated memory ensures a more than adequate video performance. Our 3D benchmarks will show whether the same holds true for gaming. For comparison, we take a look at both the HP Envy m6-1101sg and the Acer Aspire V3-571G-73614G50Makk (who comes up with these names, anyway?). With an Intel Core i5-3210M 2.5 GHz and a dedicated AMD Radeon HD 7670M as well as an aluminum chassis, the HP Envy comes very close to our test device, spec-wise. The V3-571G comes equipped with a superior Intel Core i7-3610QM 2.3 GHz as well as a dedicated Nvidia GeForce GT 640M GPU, but it suffers from having just 4 GB of memory. 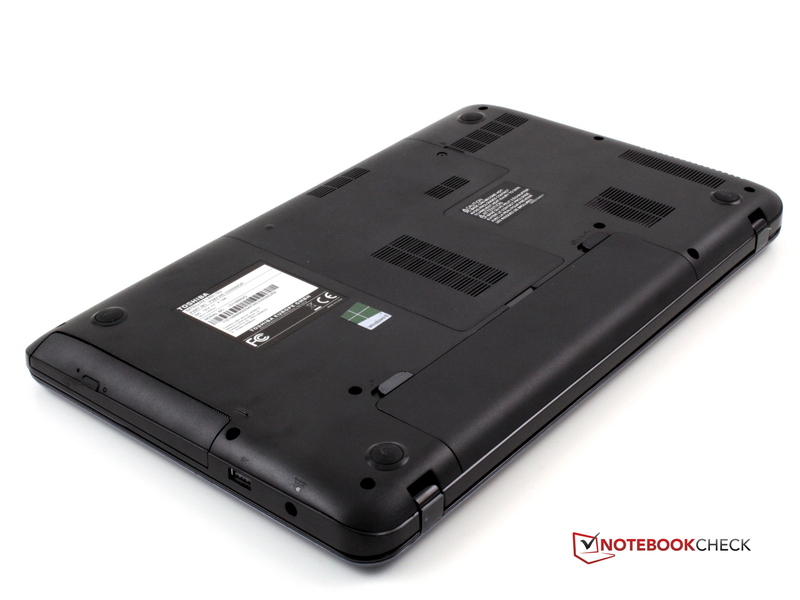 There is also an AMD-based variant of the Toshiba Satellite L855 series with a "D" in its name as well as a less "cool" series called L850 which comes equipped with a black chassis made from plastic. Both the lid and the palm rest of the Satellite L855-U15 are made from ice-blue colored brushed aluminum. The aluminum finish guarantees a high-quality look. The Toshiba logo is placed in the center of the lid with glossy aluminum letters. The rest of the case is constructed using black plastic. Both its sides and the frame surrounding its reflective display are glossy while the bottom is matte. Unfortunately, the lid is not sturdy at all. It can be bent and twisted very easily. Applying pressure in the center results in the lid actually touching the display panel. At least, the hinges are firm, keeping the display steady. 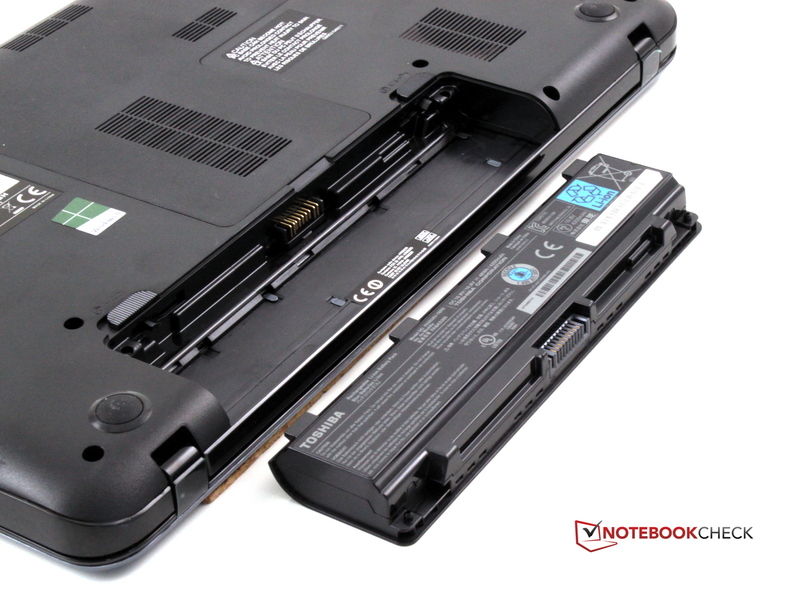 Using just one hand, the laptop should only be opened in the middle in order not to risk damaging the panel. However, the palm rest appears to be quite robust, barely wobbling at all when it is squeezed. It feels cool to the touch, but this is actually quite enjoyable since it turns lukewarm quickly enough. The touchpad is optically separated from the remainder of the palm rest, where it has been fitted within an extra inlay. The keyboard yields slightly when pressure is applied, more so in the vicinity of the numpad right above the DVD drive. 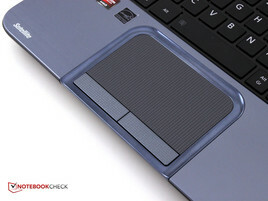 The entire lower half of the laptop is quite sturdy and can be carried with one hand without risk of twisting. Only a small portion above the optical drive gives in too easily. The ports of the L855-15U are placed on the left and right sides of the device. Only the multi-card reader can be found at the front. According to Toshiba, it supports SD cards of up to 2 GB, miniSD/microSD cards (with an adapter) of up to 2 GB, SDHC cards of up to 32 GB, SDXC cards of up to 64 GB and multimedia cards of up to 2 GB. Unfortunately, the card reader is placed too low so that the entire laptop has to be lifted whenever a card is to be inserted. There is enough space on the left-hand side for the USB 2.0 port, the DVD drive and the power connection. The ports don't interfere with each other and the USB 2.0 port is capable of supporting sleep-and-charge. Things look differently on the right-hand side. The remaining ports are so close to each other that larger plugs obstruct each other. In addition, almost all ports can be found next to the front of the device, which can prove to be a bad design choice with regard to mouse usage by a right-handed person. This could have been solved differently. 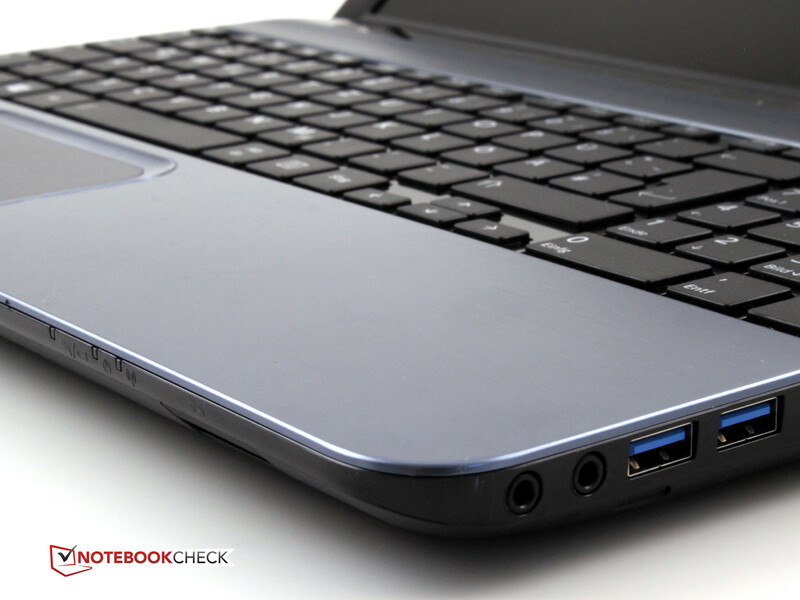 Otherwise, the laptop sports all currently common ports, as can be seen below. The Satellite L855-15U comes equipped with Bluetooth 4.0 as well as Wi-Fi 802.11 b/g/n (Atheros AR9485WB-EG) and Gigabit LAN (Atheros AR8161/8165 PCI-E). 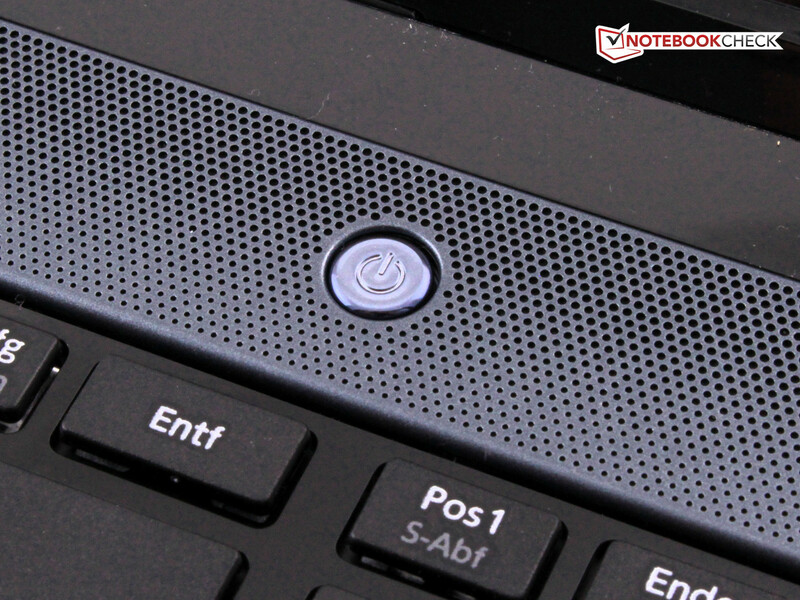 The competing HP Envy m6-1101sg merely offers the old Bluetooth 3.0 + HS standard. From a distance of just three meters the Wi-Fi reception is excellent. It is still good (upper floor as well as from 15 meters away) or at least sufficient (40 meters distance) from further away. The HD Webcamera, as Toshiba calls its webcam sporting a resolution of 1280x800 pixels, yields acceptable images under daylight conditions. 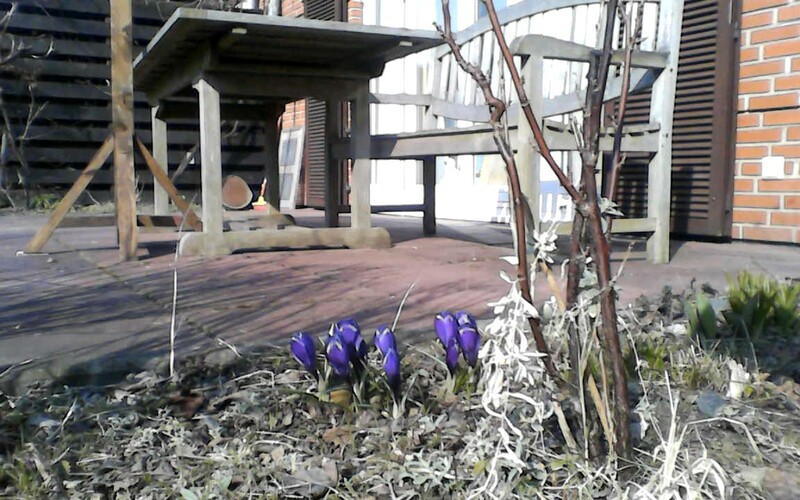 Still, this is far from what one might expect from an "HD" camera. Colors are dull and lacking in sharpness. Pictures have a blue tinge. 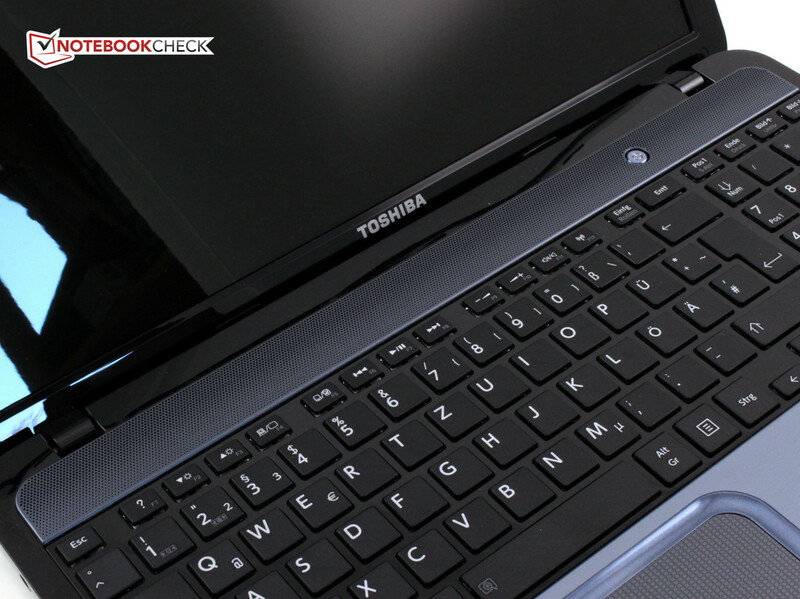 The webcam offers no more than 10 fps, a fact which Toshiba tries to conceal by adding a slight delay. This causes lines and edges to become blurry, leading to an almost psychedelic background effect whenever the L855-15U is moved around. Next to a quick start guide and a manual for safe and comfortable operation there is nothing else in the cardboard box, not even a recovery DVD. Some notable Windows 8 apps come pre-installed: Nero 12 not only includes the famous burning software but also a video cutting tool and a video converter which may come in handy. Most prominently positioned though is Toshiba Places, but apart from links to Toshiba's support pages this contains almost exclusively paid subscription-based streaming services for music or video as well as offers from Toshiba. In addition, the L855 ships with a copy of Skype, a test version of Microsoft Office 2010, a Toshiba-made video player and a DRM media receiver which can be used to stream content from network media devices such as smartphones, tablets or PCs to the Satellite L855-15U. 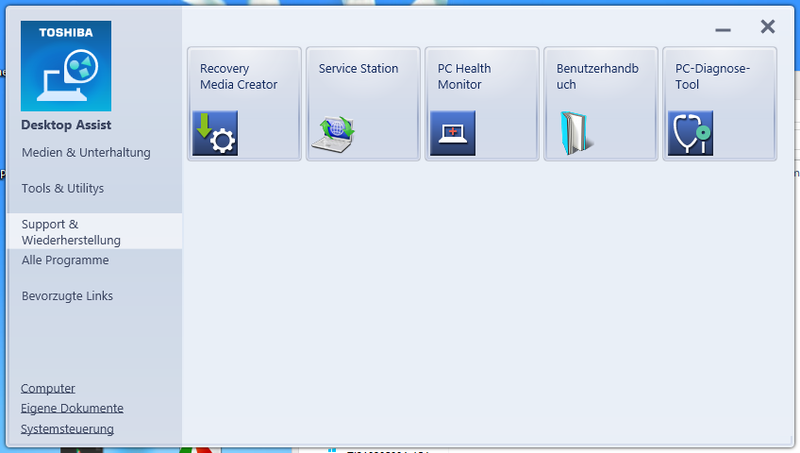 Toshiba's System Settings app allows the user to change settings such as the order of boot devices or reactivation via LAN without having to resort to the BIOS, while a Recovery Media Creator offers to create up to three recovery DVDs. After just one screw is loosened the maintenance hatch beneath the base unit can be opened. 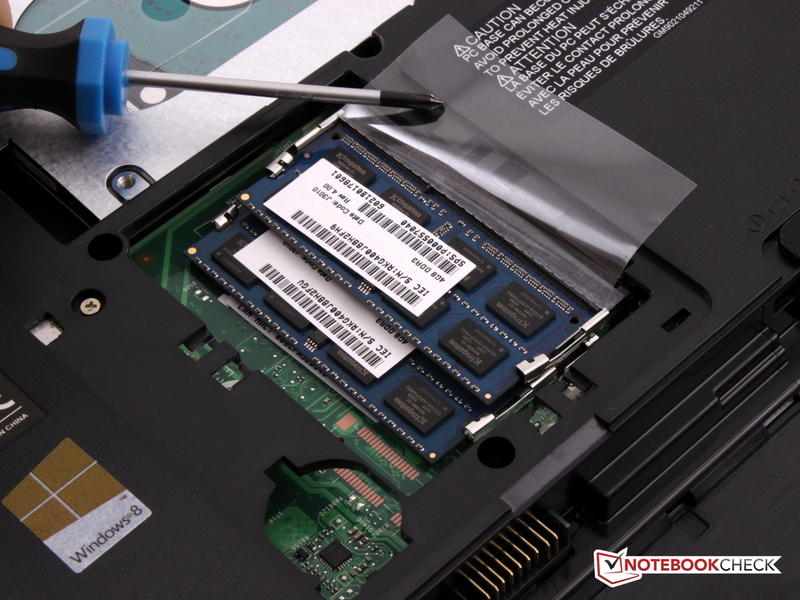 RAM, two free slots and the hard drive are now easily accessible and even the battery, which powers the BIOS whenever the laptop is inactive, can be swapped easily. The fan, however, remains hidden beneath a wire grill, so that it cannot be freed from dust. 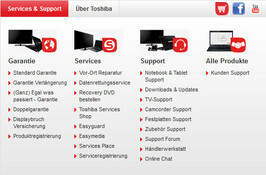 Toshiba offers two years of warranty by default. 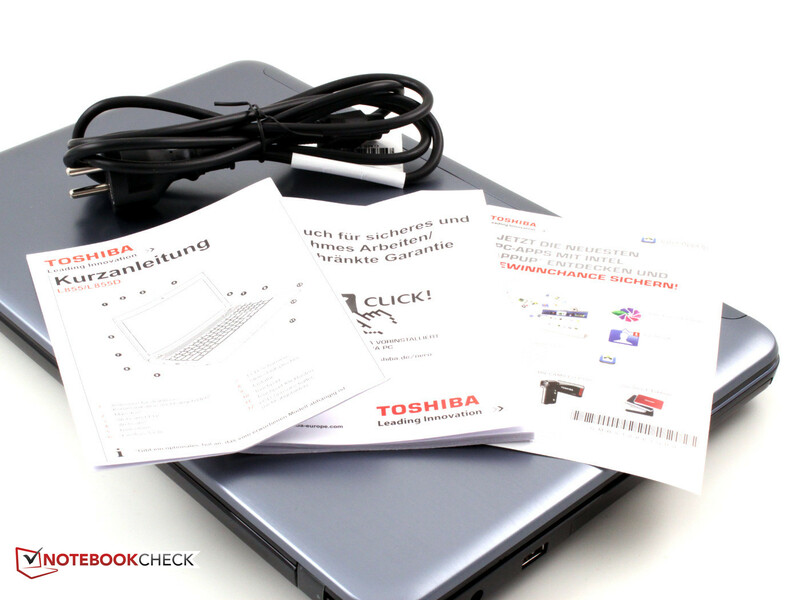 The device has to be carried to a service center unless the malfunction is brought to the attention of the Toshiba hotline. 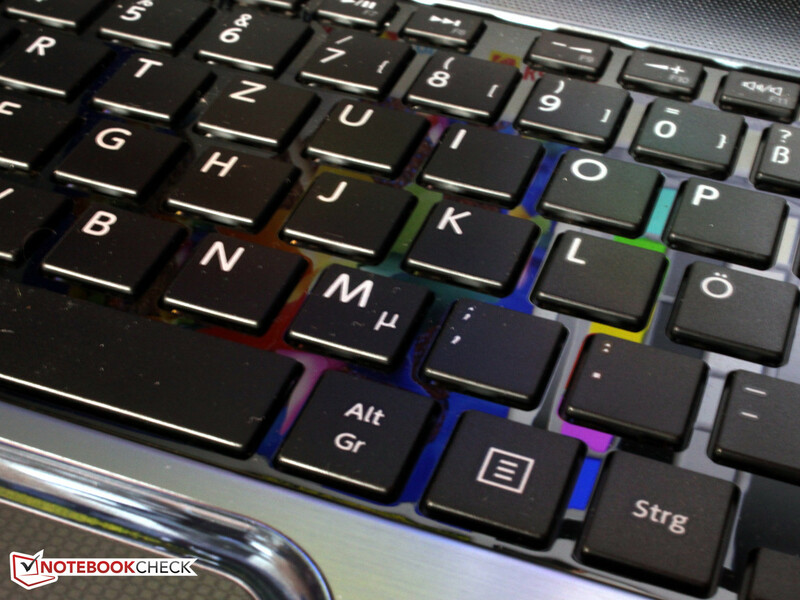 In this case, an on-site service is offered, collecting the laptop right at home and delivering it back once it is repaired. In addition, many other options can be added for a fee, ranging from a simple warranty extension and a data salvage service which manages to recover crucial files from a damaged hard drive to a "whatever-happens warranty" which includes a free hotline, theft insurance and other services. 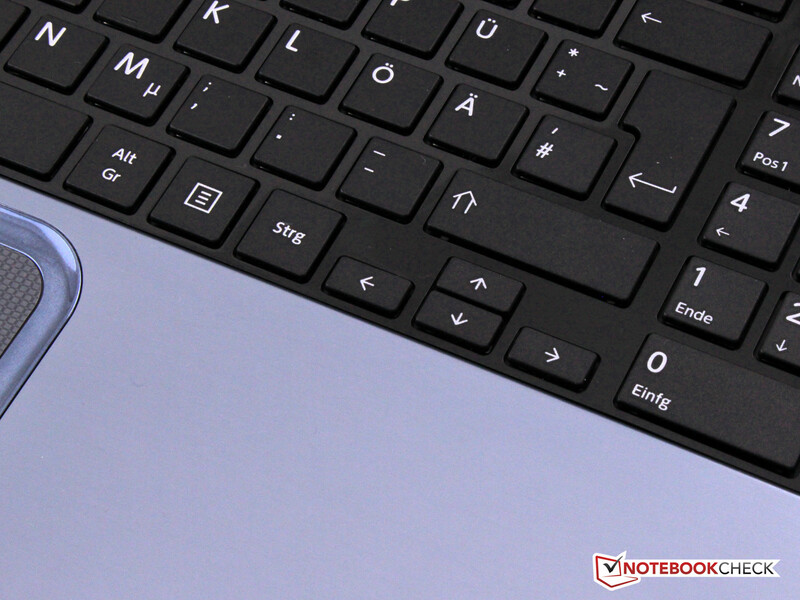 The matte black keyboard includes 102 keys, those of a dedicated numpad among them. A small green LED fitted within the Num key shows whether the numpad is currently activated. We like that most special keys are placed in the top row, reachable via the Fn key since they share the same row with the function keys. The pressure point reminds us of the 80s when self-built computers shipped with membrane keyboards. Key travel is definitely very short and keystrokes feel hard, but whether this is truly a disadvantage is a question of taste. Definitely not praiseworthy are the shortened space bar and the tiny arrow and return keys. The touchpad is shifted to the left, being separated from the palm rest by a decorative inlay. 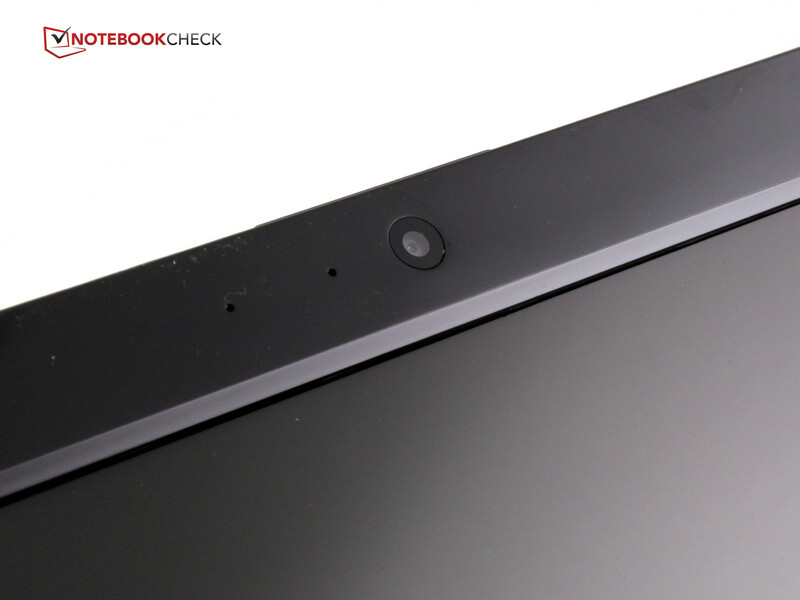 It recognizes multitouch gestures while being 9.6 x 5.6 cm large. Its smooth surface allows for comfortable handling. The two large mouse keys are physically separated from each other. They offer short key travel and a rather noisy acoustic feedback. The L855 uses Samsung's 156AT24-T01 panel. 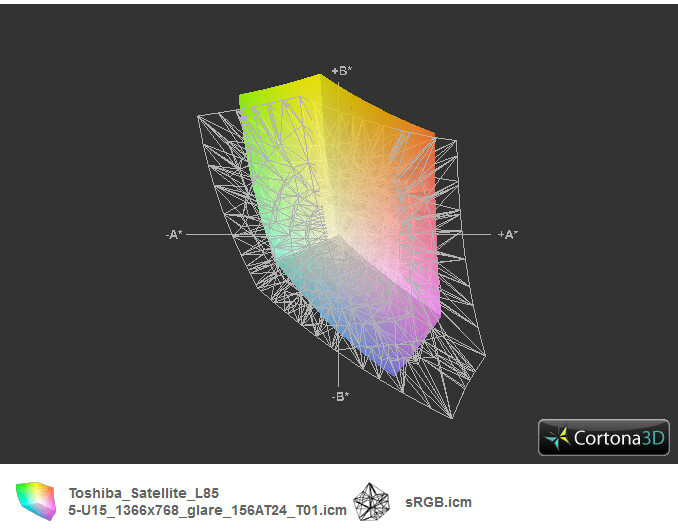 Toshiba calls it a TruBrite HD TFT high brightness display with LED backlighting. 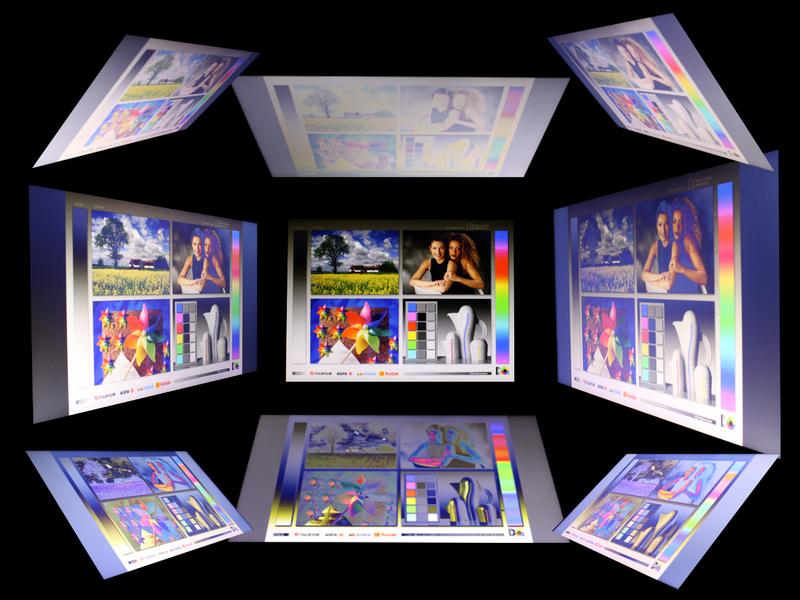 It offers a 16:9 aspect ratio and a maximum resolution of 1366x768 pixels. Its average brightness of 241.3 cd/m² secures the L855 a midfield place 20% ahead of both its competitors, the HP Envy m6-1101sg with 199.7 cd/m² and the Acer Aspire V3-571G which sports just 197.7 cd/m². The display remains this bright even when running on battery, but its luminosity homogeneity is far worse than that of its competition, with just 76% instead of 93%. Colors appear well-saturated and vivid. This is partly due to its highly glossy surface, which quickly leads to annoying reflections, even indoors. With a black level of 0.83 cd/m² and thus a contrast ratio of 319:1, the L855 takes second place between the HP Envy m6-1101sg (0.36 cd/m² and 571:1) and the meagerly performing Acer Aspire V3-571G (1.55 cd/m² and 132:1). Since it is a consumer laptop, color space accuracy is insufficient for a professional graphics designer, not even coming close to full sRGB space. Before calibration, we measured the panel via a CalMAN color analysis using an i1 Pro 2 photo spectrometer (target color space: sRGB). Especially evident is a weakness in grayscale rendering. Iin the middle of the range, DeltaE (2000) values of more than 15 occur (average: 11.6). In addition, the colors in our test device have a blue tinge. The display brightness might have been sufficient for outdoor usage while running on battery if it wasn't for its highly reflective surface. Doing any work outside the house is only feasible in the deep shade, but this also holds true for its competitors as well. Viewing angles are very narrow, both vertically and horizontally. Horizontal aberrations are slightly less noticeable, but even in this direction, the image quickly fades into low-contrast, faint and color-inverted obscurity. Toshiba's Satellite L855 series offers five variants, ranging from an Intel Core i5-3210M processor with a dedicated AMD Radeon HD 7670M GPU (1 GB of memory) and a 500 GB HDD for around 750 Euros, ~$969 (RRP according to Toshiba's website) to an Intel Core i7-3630QM CPU with the same graphics card (but with 2 GB of dedicated memory) and a 750 GB HDD for around 900 Euros (~$1163). 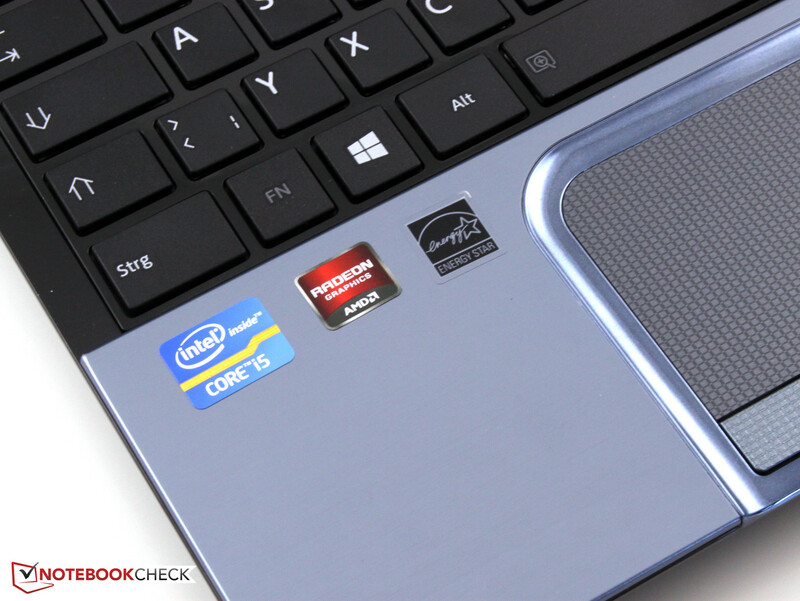 Our L855-U15 is the most well-equipped of all three Core i5 laptops. The Intel Core i5-3230M used in our test device is an Ivy Bridge generation dual-core CPU which can run up to four threads simultaneously thanks to Intel's Hyperthreading technology. 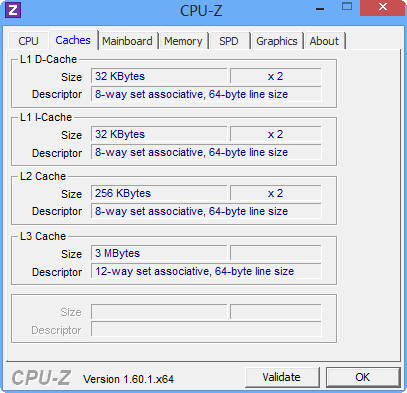 The L3 cache offers 3 MB of memory. Turbo Boost functionality allows the dual-core to increase its standard clock speed from 2.6 GHz to up to 3.2 GHz when necessary. Temperature management is no issue and even under full load, while running Furmark and Prime95 at the same time, performance was never diminished. The Turbo Boost is used to the fullest, no throttling occurs. 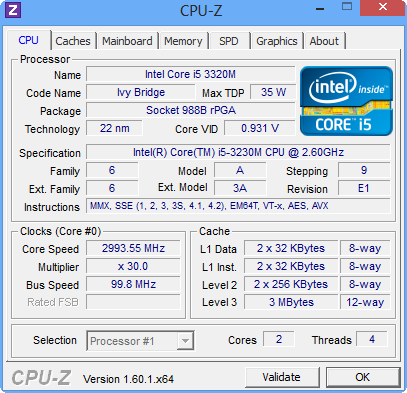 We tested the Intel Core i5-3230M CPU using the Cinebench R11.5/R10 benchmarks. 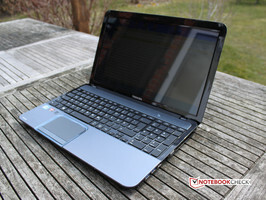 The Toshiba Satellite L855-15U performs as expected, yielding approximately the same results as the HP Envy m6-1101sg. When compared to a quad-core CPU, however, the Acer Aspire V3-571G proves to be superior. While the single CPU performance difference is not noteworthy (6%), the larger Intel Core i7-3610QM 2.3 GHz showcases its might during the multi CPU runs, beating our test laptop by 114%. Even without any external power supply, the same Cinebench R11.5 CPU benchmark values are reached. 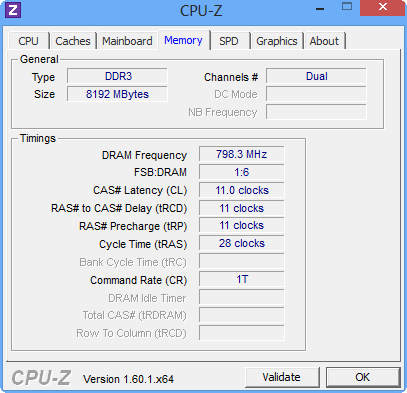 Just the Turbo Boost of the graphics card is not fully used, with a GPU core clock speed of only 400 MHz instead of 600 MHz and a GPU memory clock speed of 400 MHz instead of 900 MHz. The performance of the Satellite L855-U15 is more than sufficient for typical activities such as office usage and multimedia applications such as DVDs, videos or YouTube. Even games are possible when lower quality settings are chosen. Unfortunately, Windows 8 takes longer to load than we would have expected - approximately 18 seconds until the start screen becomes visible. Copying files feels slow, but more about that later in this article. 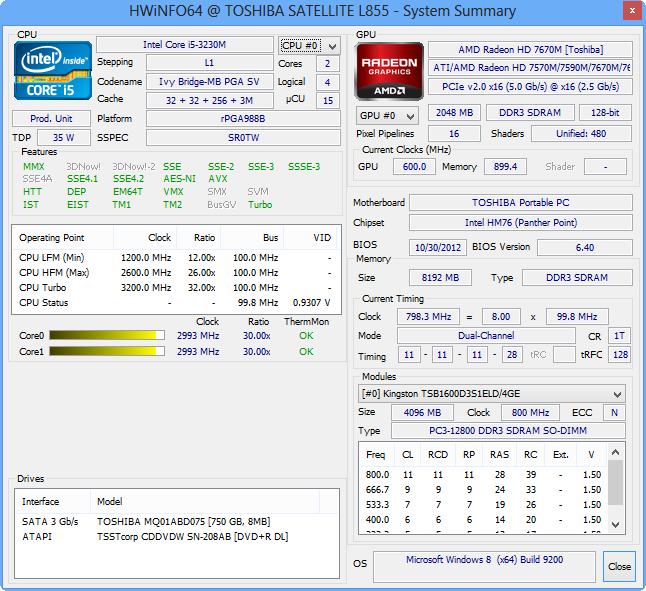 During most kinds of usage, the slightly slower hard drive of the Satellite L855-15U is not as noticeable. 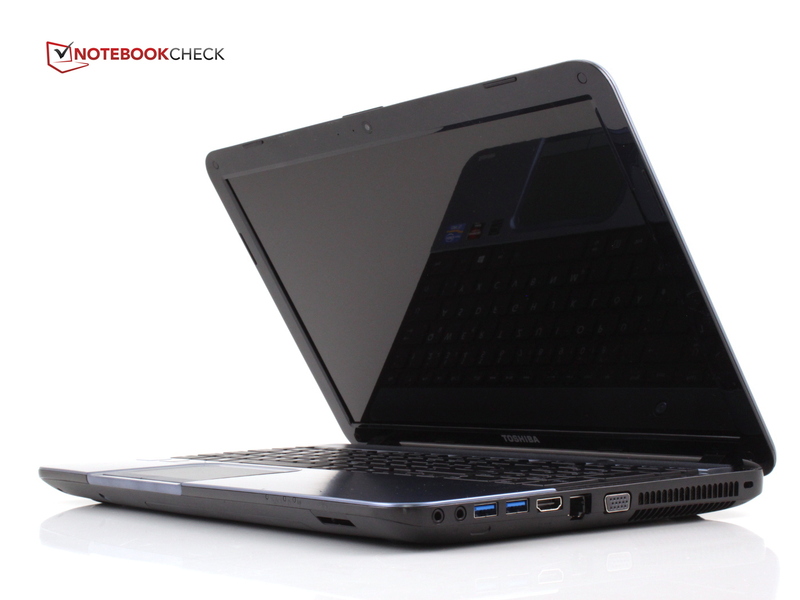 Correspondingly, the PCMark 7 score of 2432 points for the L855 comes close to that of similarly equipped devices. But when only the PCMark Vantage 1024x768 HDD score is considered, the L855-15U fares far worse (by about 30%) than both the almost identical Toshiba Satellite L850-153 and the Acer Aspire V3-571G. 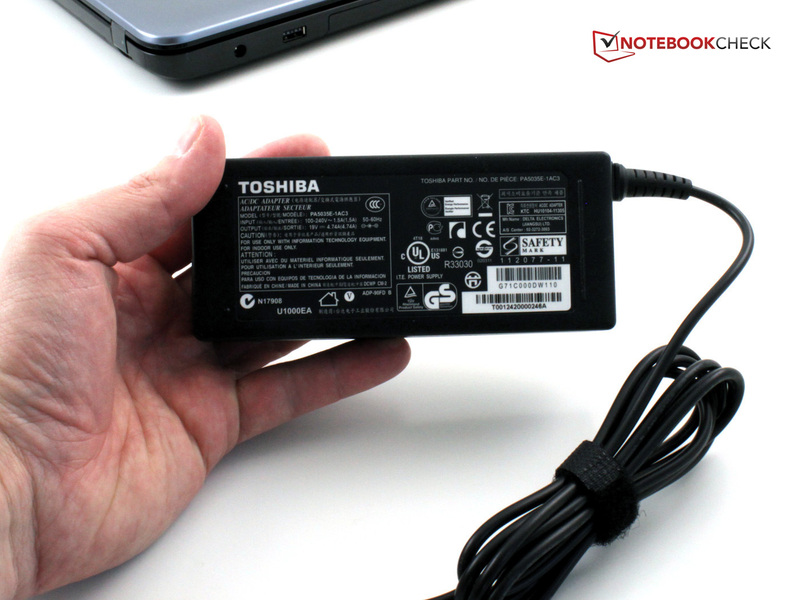 The Toshiba MQ01ABD075 used in the L855-15U offers a capacity of 750 GB and 5400 rpm. Both its data transfer rate of 71.1 MB/s and its access time of 19.3 ms are below average. 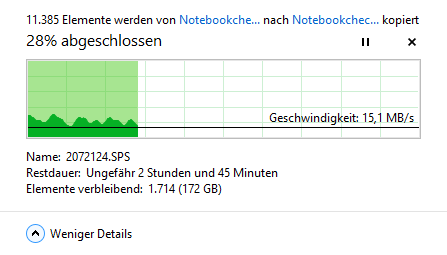 Copying files within the internal HDD as well as from an external HDD via USB 3.0 always results in disappointing data transfer rates of around 17 MB/s (read and write). Toshiba uses a dedicated GPU made by AMD, a Radeon HD 7670M with a core clock speed of 600 MHz and a memory clock speed of 900 MHz. Its dedicated graphics memory of 2048 MB can be expanded using some of the 8 GB RAM the system comes equipped with. 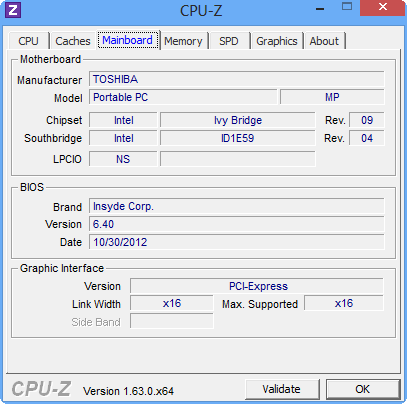 Up to 4847 MB is possible when a 64-bit operating system is utilized. Our test device manages to score 8691 points in the 3DMark06 benchmark, approximately the same as the HP Envy m6-1101sg (8801 points). The Acer Aspire V3-571G employs an Nvidia GeForce GT 640M, reaching a far superior score of 12843 points. As mentioned above, the L855-U15 cannot access all of its graphics prowess while running on battery, since the Turbo Boost is not utilized to its fullest, with maximum clock speeds of 400 MHz (core as well as memory clock speed). All three games we tested actually ran smoothly in the native resolution of 1366x768 pixels with reduced details. Less demanding games such as FIFA 13 can even be played with higher graphics settings, while this is obviously not the case for Anno 2070 and Battlefield 3. More than medium settings are too much for the L855-U15. In this case, a more powerful graphics card such as the Nvidia GeForce GT 640M (which is used in the competing Acer Aspire V3-571G, a laptop which also sports a superior CPU, the Intel Core i7-3610QM, despite its similar price) remains a necessity. 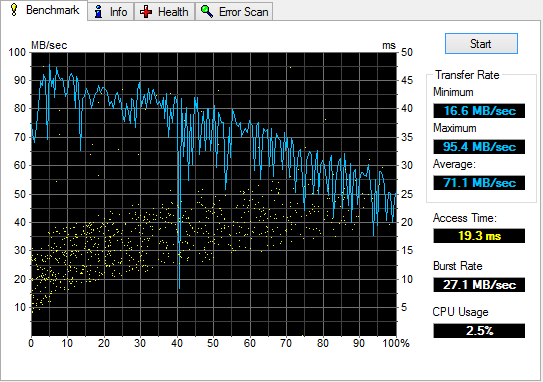 The Toshiba Satellite remains rather silent while in idle mode, never exceeding 32.2 dB. 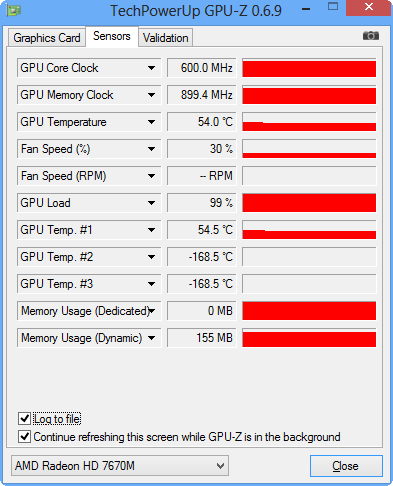 The fan doesn't even start spinning until the CPU is working. In this operation scenario, the laptop can easily be heard. We measured an average loudness of 35.4 dB - which is still less than the 38.5 dB the Acer Aspire V3-571G emits while under full load. 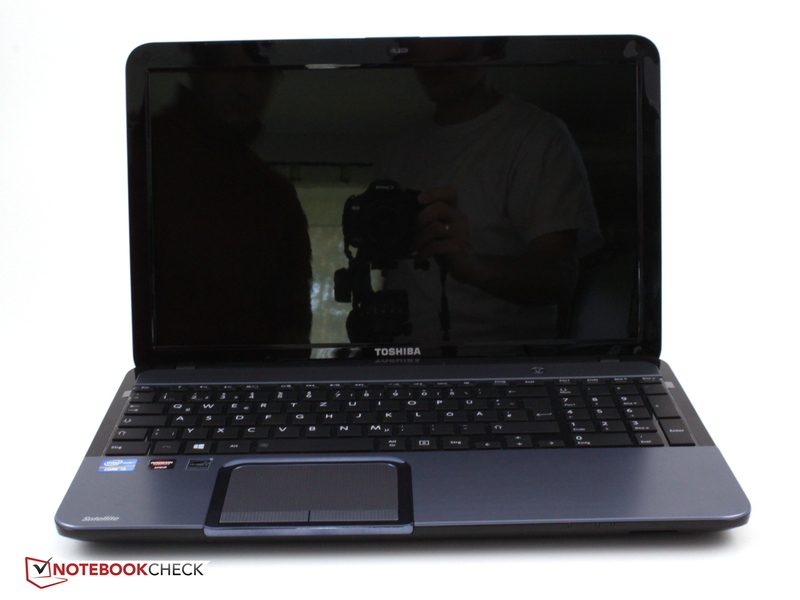 The Toshiba Satellite L855-15U remains astonishingly "cool" during ordinary usage scenarios. Its left palm rest always remains cool, while even the right half never becomes uncomfortably warm, thanks to its aluminum surface. Heat conduction works impressively well. Neither the laptop's surface nor its innards ever get exceedingly hot, thus preventing any throttling from occurring. It is even possible to play demanding games on one's lap without any problems. 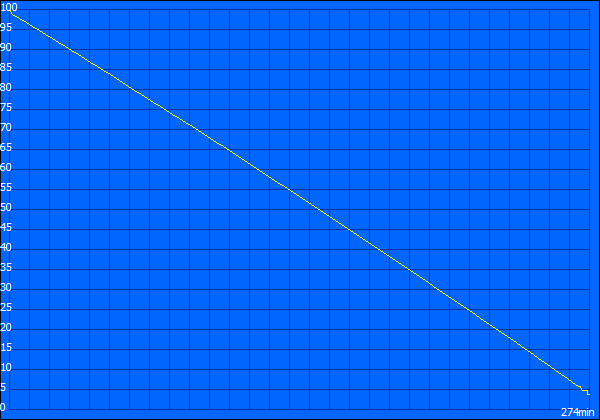 The Satellite's average temperature while idle lies around 27.7 °C. 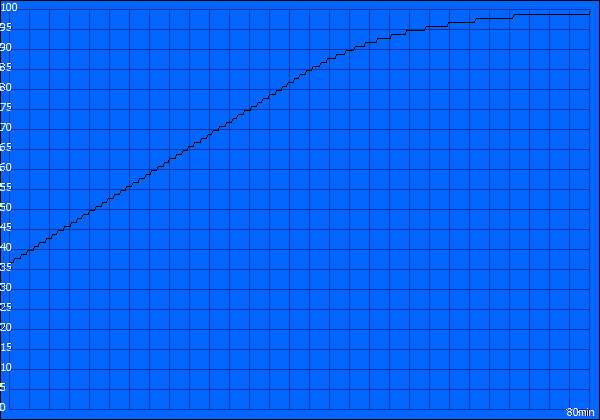 Under full load, an average value of 31.5 °C is reached, with up to 42.6 °C next to the vent. This is impressively cool. While the HP Envy m6-1101sg offers a similar performance, Acer's Aspire V3-571G gets far hotter (33.3 °C while idle, 45.3 °C on average under full load). The speakers used in the L855-15U sound rather flat, as is usually the case with laptops in this price range. They are lacking in bass. External speakers will be necessary in order to achieve an enjoyable acoustic experience. 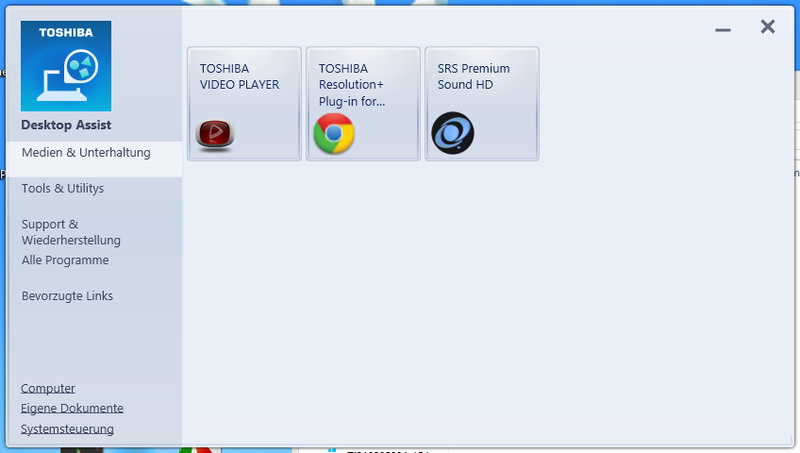 Even Toshiba's preinstalled SRS Premium Sound HD software, while impressive in its own right due to a wide range of sound effects, is incapable of mitigating these issues. The maximum volume is sufficient for a workplace, but not enough to fill an entire room. 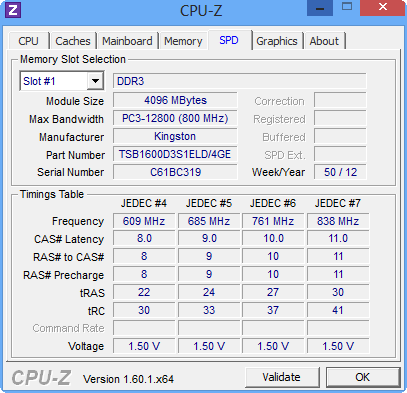 While idle, the multimedia laptop needs somewhere between 13.7 and 16.1 watts. This - as well as 0.7 watts of power consumption during standby when 0.5 watts is the norm - is far too much for such a laptop. It competitors only use 8.3 to 14.3 watts. Power consumption surges rapidly under full load. 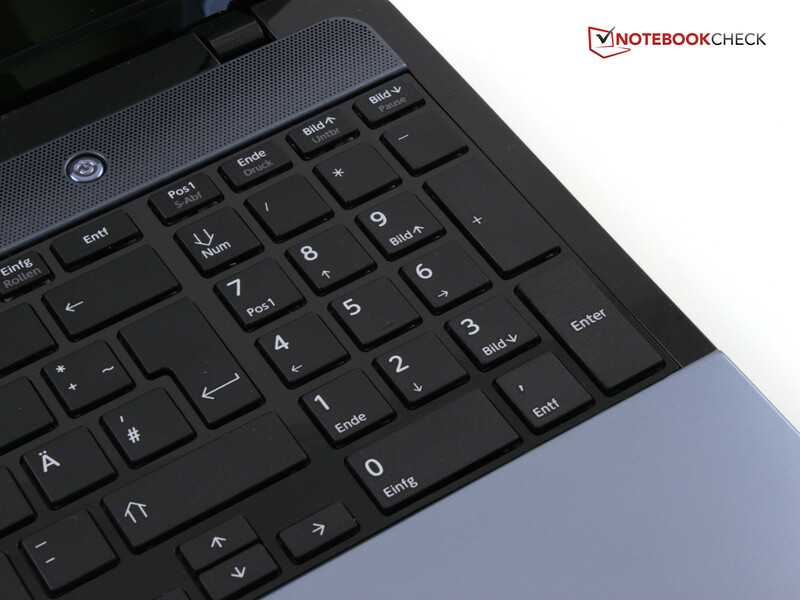 With Furmark and Prime95 running at the same time, the 15.6-inch laptop requires 58.2 watts, 10 watts more than the HP Envy n6-1101sg. At least the 90 watts power adapter is sufficiently large to meet the Satellite's power requirements. According to its data sheet, the 48 Wh lithium-ion battery offers a runtime of up to three hours. 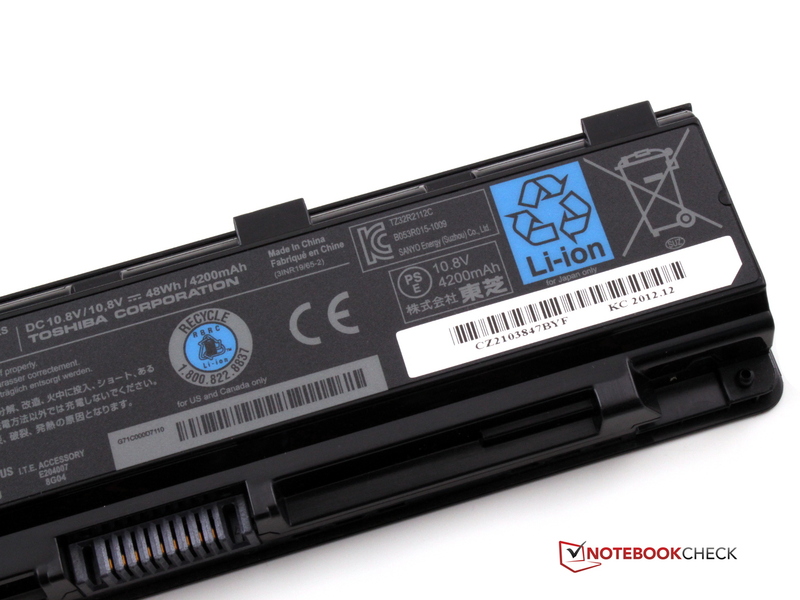 We tested it using four scenarios from the Battery Eater 05 benchmark. The Reader's Test turns the screen brightness way down and deactivates all radio modems, thus simulating a reading scenario. Here, the L855-15U manages to survive for a maximum of 4 hours and 34 minutes. Under normal usage (office programs, surfing the web), the battery lasted for 2 hours and 40 minutes. 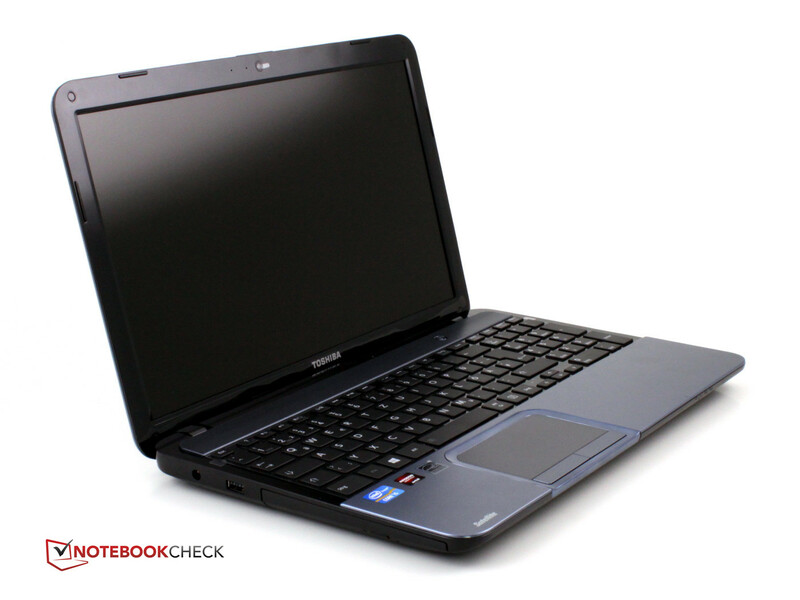 As a multimedia laptop, the L855-15U is not suited for excessively long movies. After just 1 hour and 59 minutes of watching a DVD, the laptop died. Under full load, using the Battery Eater Classic Test, battery life went down to 1 hour and 14 minutes, after which it takes 80 minutes for the laptop to fully recharge. 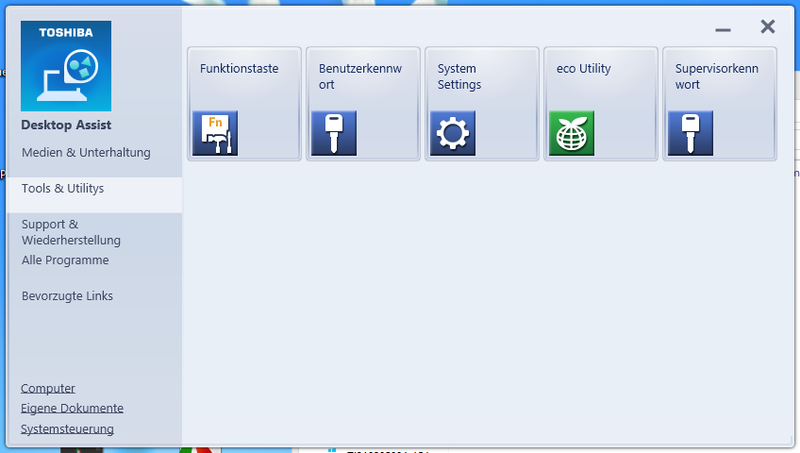 Toshiba has included a separate energy saving profile, promisingly called Eco. Unfortunately, we didn't see any miracles. With just 3 hours and 40 minutes, battery life was actually worse than during our own Reader's Test. During our normal usage test, 16 minutes was gained. Under full load, the difference between Eco and Standard went down to just 6 minutes. 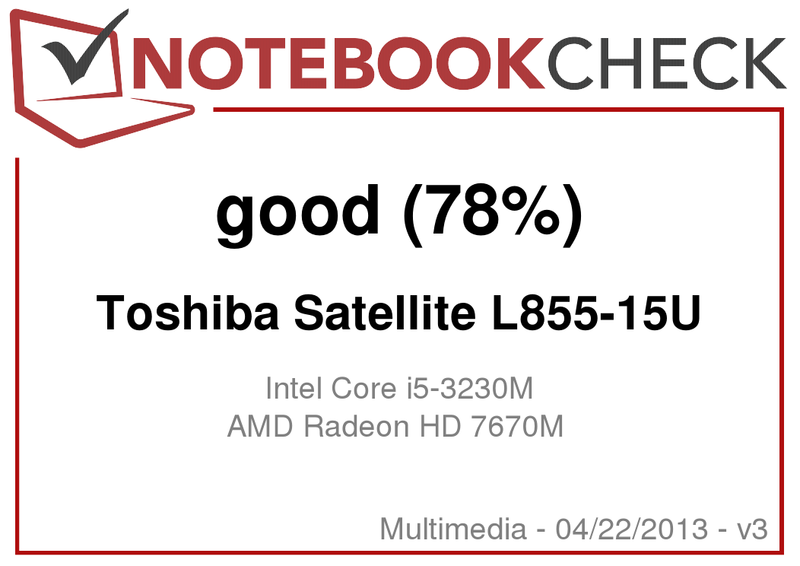 Despite its "cool" looks and feel due to its brushed aluminum chassis, the Toshiba Satellite L855-15U exhibits weaknesses concerning its stability, especially around the sensitive display area. A sturdier lid which didn't get bent out of shape so easily would have been desirable. Plus, we didn't like the tiny arrow and return keys. The performance of this multimedia laptop is rather underwhelming as well: The AMD Radeon HD 7670M only suffices for gaming when details and resolution are set to low. Both its performance and its equipment are neither surprising nor too disappointing though. We simply didn't expect much more for 630 Euros (~$814). If it is an option to spend up to 800 Euros (~$1034), then the Lenovo IdeaPad Y580 with its Intel Core i7-3630QM, 8 GB RAM, 1 TB HDD and an Nvidia GeForce GTX 660M GPU might be a viable alternative, especially so for gamers. It ships with a few brochures. The entire outer chassis is made from aluminum. Powered by an Intel Core i5. Power is supplied by a 90W power adapter. Which appears to be rather on the thick side. The bottom panel is completely black. The vents are visible here. As well as the HDD, once the panel is taken off. 8 GB RAM is built-in. The battery offers a capacity of 48 Wh. There is a DVD drive. 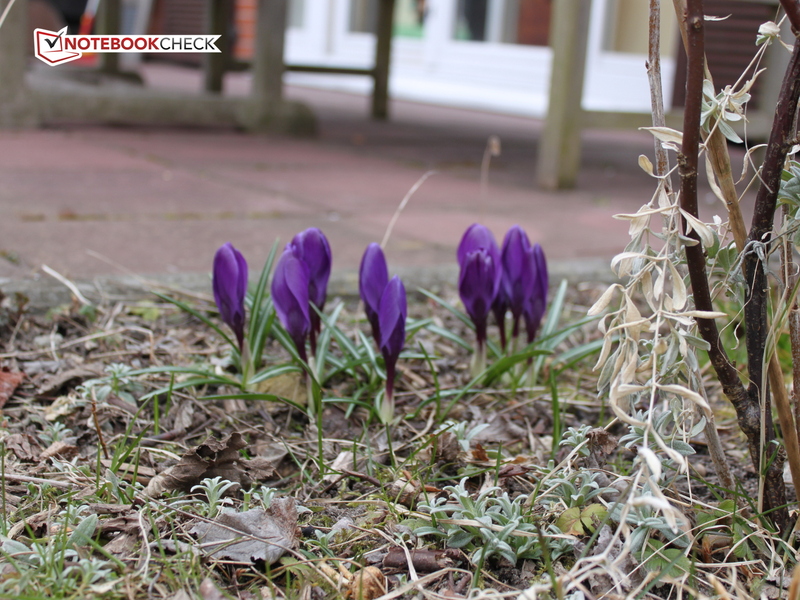 The same shot taken with a Canon 500D. The sound is emitted from below the display. ...and reflects light inbetween the keys. The touchpad is slightly detached via an inlay. 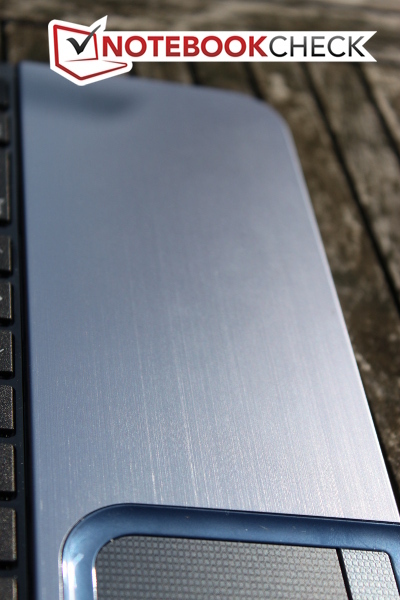 The L855 offers a brushed aluminum finish. The brushed aluminum case with its subtle blue cast. The silent and cool operation mode. Toshiba's software. Improved build quality for the lid. More space between the different ports. That the lid can be bent out of shape so easily - so much that it can be forced to touch the panel itself. 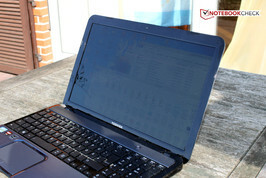 Acer Aspire V3-571G-73614G50Makk, HP Envy m6-1101sg, IdeaPad Y580.